I really enjoy Cocoa, but I really hate Interface Builder. EDIT: I just saw my post from over a year ago... LOL boy have things changed. Topic: convert h.264...Any easy way? Re: convert h.264...Any easy way? Topic: Thoughts on augmented reality? Re: Thoughts on augmented reality? AR is a pretty broad term... Wouldn't having GPS and Google on your phone right now count as AR to some extent? They are augmenting your reality. I have a pretty good beard, but it's not a ridiculous lumber jack beard as posted earlier in the thread, does that disqualify me? I was going to wink and gun, but then I read "highschool" and holstered. 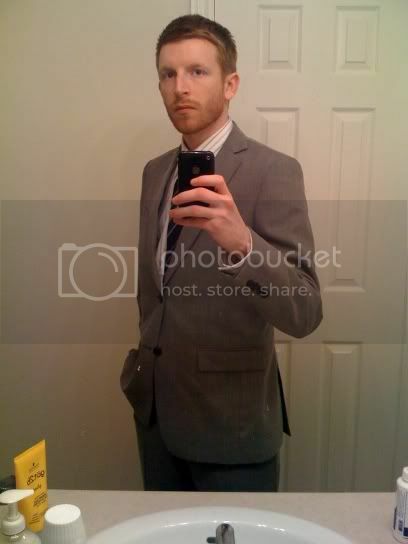 Yikes, I wish I looked that good in a suit. Topic: What if we could control All of ourselves? Re: What if we could control All of ourselves? I think part of the answer is that things like your heart beating are controlled by your brain stem, whereas consciousness is a product of the cerebral cortex. Topic: Off-colour jokes: "x is NOT funny!" Re: Off-colour jokes: "x is NOT funny!" Off-colour jokes: "x is NOT funny!" Topic: Beta test my stuff for me? Re: Beta test my stuff for me? I'll give it a try tomorrow at work, I don't have a mac at home. Mono is probably my favourite. Topic: Low-level file manipulation in C++? Re: Low-level file manipulation in C++? Can't you just work on a per-byte level? Create a byte that represents the bits that are meant to be flipped, then run a bitwise not on the byte to be encoded? eta - I don't really know a good answer for you, i'm just throwing things at the wall here. Well even a low-end SLR digital camera can run you up to a grand (and lenses even more), that's not too outrageous for a professional photographer. My brother just got drafted to professional lacrosse and is trying to put on weight. The dietician said there's only one way to do it: Eat lots. He's on a diet of at least 6,000 calories per day. Make sure you choose food you like though because you need to eat a lot of it. Topic: Diagnose my car's speaker problems! Re: Diagnose my car's speaker problems! Could be a number of problems. The fact that the front right speakers aren't working suggests it could be an issue with the amplifier or radio.